Chicago – In 2000, Windy City Times established an award to acknowledge the young movers and shakers of the GLBT community: the 30 Under 30 Awards. Thirty young activists, journalists, students, HIV/AID volunteers and performers each under the age of 30 were honored for their achievements in moving the GLBT community forward. Five years later in 2005 another 30 will get their honors on Wednesday, June 8 at the Hilton Chicago. With more nominations coming in than previous years, it shows that there are many young people working everyday to make a change may it be in their school, in their community or in the world. Honoring them for their hard work hopefully help them continue to grow and make others aware of the great things they do. This year's 30 honorees will be recognized for impacting or contributing to the GLBTQ community or mainstream community and include a queer radio show co-host ( 27 ) , a college lesbian athlete once named national player of the year ( 21 ) , co-founder of a queer/fat/femme burlesque troupe ( 26 ) , Chicago Public Schools science teacher ( 29 ) , a director of development of a major community center ( 28 ) , lesbian plumber who's training to become a professional boxer ( 24 ) and twenty-four more outstanding honorees. Each in his or her own way, they have left an indelible mark on the community. 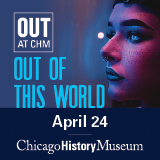 The celebration headed by Windy City Times newspaper will be co-hosted with AIDS Foundation of Chicago, Lesbian Community Cancer Project and Chicago House. The event is from 6 – 8 pm at the Hilton Chicago, 720 S. Michigan Ave. This is a free event however RSVPs are being requested due to limited seating. RSVP to 773-871-7610. Windy City Media Group has received several top awards in 2005 including the Peter Lisagor Award for deadline news reporting to Cathy Seabaugh, Andrew Davis received an award for his coverage of African American AIDS issues, and Publisher Tracy Baim received the Community Media Workshop's Studs Terkel Award. This year Windy City Times celebrates its 20th anniversary delivering the news. Also produced by Windy City Media Group: Nightspots, Windy City Radio, and Identity. Also see: www.windycitymediagroup.com .